Welcome to the new Stained Page News! Taking into account feedback from the reader survey—thanks to everyone who filled that out—I've streamlined things a bit, giving everything a makeover, and launched a website where the archives will live. I'm also going to start including a recipe in every issue: this week, there's a fine, fine large batch pisco cocktail from Maggie Hoffman's The One Bottle Cocktail [Ten Speed] at the end of the newsletter. THAT ought to get your spring kicked off properly. Not much else has changed, though. I'm still writing about cookbooks; you're still sending me tips (stainedpagenews@gmail.com), sharing this newsletter with a friend (now via the shiny new stainedpagenews.com), and checking out my cookbook, The Austin Cookbook: Recipes and Stories from Deep in the Heart of Texas [Abrams]. To the news! 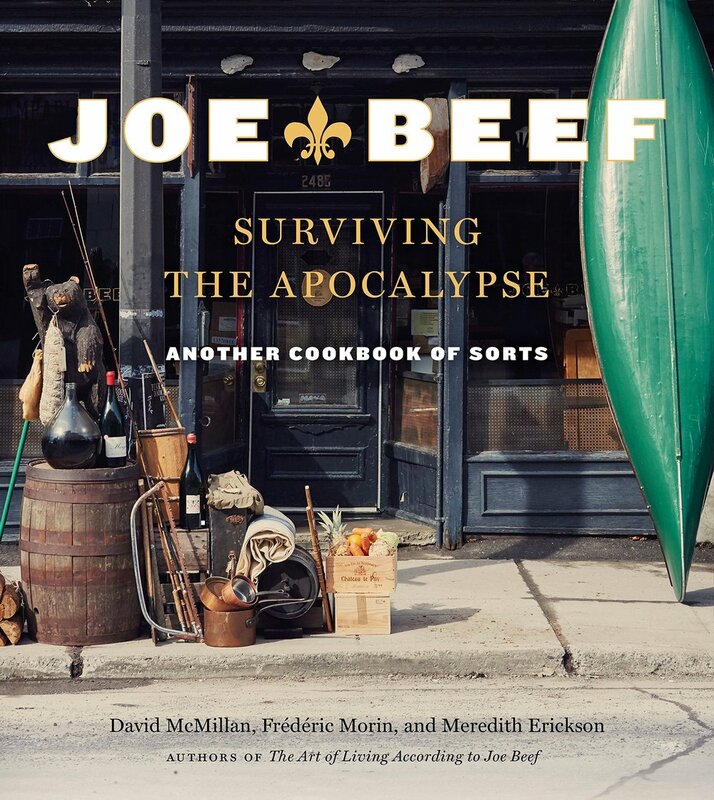 Behold the cover for Joe Beef: Surviving the Apocalypse: Another Cookbook of Sorts [Knopf] by Montreal chefs David McMillan and Frédéric Morin, and cookbook author Meredith Erickson. The first Joe Beef book, The Art of Living According to Joe Beef, is an all-time favorite of mine. Needless to say, I'm pretty excited. And there are details, too, although...well, let's quote the product description. Calling it "a new cookbook for these apocalyptic times," there are 150 recipes from soap to "Smoked Meat Croquettes and Muffuletta à la Maité (a gloriously stuffed loaf pâté of ham, Gruyère, foie gras, and onion jam)...Hardtack (aka Prison Bread) and Pickled Eggs to Dulse Potatoes in a Bag and Beef Jerky...homemade Power Bars...exquisite Mousse au Chocolat with Chantilly à la Prâline Rose to the survivalist Moose Stew and Chips." So here's hoping your end times bunker has a good supply of wine and foie, I suppose? Or that you can book it up to Montreal to visit McMillan and Morin in theirs. New details on Chrissy Teigen's upcoming second cookbook! The Twitter phenom's first book, Cravings [Clarkson Potter], was a pretty big hit, so obviously there's a lot of anticipation around this one. And, well, looks like it might have a release date. According to the Amazon listing, Teigen's second cookbook will be released September 18. Caveats: Clarkson Potter declined to comment, and release dates are not always set in stone. But it looks like early fall 2018 is likely. Stay tuned for more. Punch's spring and summer cocktail book preview. Congrats to fellow Texan Joanna Gaines on her first cookbook, Magnolia Table: A Collection of Recipes for Gathering [William Morrow], which presumably answers the question of which dinners go best with an open format modern farmhouse kitchen. The recipes actually kind of read as modern farmhouse food, if that makes sense: chocolate chip cookies, asparagus fontina quiche, white cheddar bisque, fried chicken with poppyseed jam, overnight French toast. And over on the West Coast, we have What's Gaby Cooking: Everyday California Food [Abrams] by Gaby Dalkin (which yes came out last week, apologies to Gaby et al.). Think light and bright California food: cauliflower grain bowls, avocado toast, and the occasional margarita. Speaking of California, legendary chef Jeremiah Tower has released an e-book. Flavors of Taste: Recipes, Memories, & Menus is "about ingredients—about how to treat them, Jeremiah Tower's favorite ways that they've been used in the last hundred years, and how they've shown up in legendary menus. It includes favorite recipes and memories, both old and new." He discussed it with Town & Country here. If you're feeling more Southern, check out Ashley English's Southern from Scratch: Pantry Essentials and Down-Home Recipes [Roost]. Pantry recipes (dill pickles, muscadine jelly) and what to do with 'em (fried pickles, muscadine-glazed meatballs). You can serve this easy-drinking grapefruit cocktail from Matt Friedlander of New York’s Sweetwater Social in a punch bowl with a big ice block. But I like to prep the mix in advance, stash it in the fridge in a pitcher, then pour it into ice-filled glasses. Be sure to have an ice bucket on the side so people can add more ice to their glasses when they pour a second round. I love how pisco highlights the honey and grapefruit flavors here—but you can also make this easy, citrusy drink with vodka or blanco tequila. If you have an electric citrus juicer, you can save some time. Otherwise, you’ll want to put some of your guests to work with a squeezer. Pour pisco, honey syrup, grapefruit juice, lime juice, and hot sauce into a 2 ½- or 3- quart pitcher and stir well to mix. If not serving right away, cover and refrigerate for up to 2 hours. When ready to serve, stir well and pour into ice-filled rocks glasses. Garnish each glass with a half-moon of grapefruit and a pinch of flaky salt.